Direct Bookings have become much more difficult to obtain than they were even 18 -24 months ago. There are many contributing factors as to why this is happening. Many of these reasons have eluded Innkeepers and will continue to do so until we bring this topic into the light. This is a world-wide issue and it is not a fight that Acorn can win alone. We must join together to take a stand in order to make a difference. A few months ago, I approached both Rob Fulton of AIHP and Kris Ullmer of PAII and asked if they would be willing for us all to work together to form a coalition, which quickly morphed into what we are calling the “Google Task-Force,” Google, however, is just one part of this problem. OTA’s, Trip Advisor, other Travel Sites and various additional factors also contribute to our industry’s decline of Direct Bookings. The Task-Force is designed to include leaders in our industry who are concerned about these issues, so we can form a unified stance, and advise our Innkeeping Industry on steps to take to be heard. If your local or state organization would like to be included in this task-force, please contact Rob Fulton (AIHP) or Kris Ullmer (PAII) for more information. So what should an Innkeeper do? Step 1: If you are unclear about the importance of this subject, request and watch the video “Death by a Thousand Cuts” by emailing education@acorn-is.com for access. Step 2: Understand the history behind how we got here. August 2014 – Google releases Google Hotel Ads which are almost impossible for smaller properties to integrate with. January 1, 2015 – Noticed new “Date Filters” in Google Maps during 4th Q 2014 spoke to Jade from Google Local at PAII in NOLA as to why – she didn’t know or could not share. Step 3: Understand the specific process and procedures that Google has put in place to “Dominate the Travel Industry” that affect the ability for you to receive a Direct Booking. All these items are explained in detail in the “Death by a Thousand Cuts” video. First page organic results are 70% to 90% group or Travel Agency sites, pushing individual properties lower and lower in the search results. Google My Business GMB Listings used to provide the ability to click on VISIT WEBSITE directly from the 3-Pack if you did not have any OTA rooms available for the dates set. This option is no longer available. You must now enter into maps to find the VISIT WEBSITE button. There are so many ways for a guest to “see” local data, whether it be on Desktop or on the Mobile Google APP or Google Mobile Maps-Navigate & Explore APP etc. Some of these ways no longer provide a website button above the fold. It is now integrated below in the physical address area. Google is now able to use their own Meta Search areas (in the PPC location of the SERPS) to display the OTA availability when a guest searches your inn name. 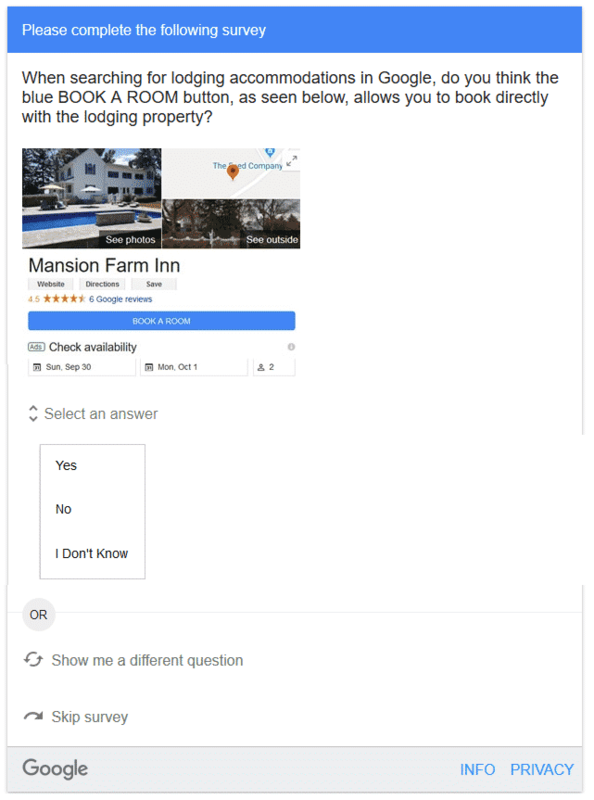 GMB allows non-lodging properties to add information to their Knowledge Graph and Maps Listings, which lodging properties are not allowed to access (except for cabins and cabin rentals). Examples: Booking, Menu and Services URLs, Business Description and Google Posts including Events, Offers and Products. It is also not unusual for Google to repress Schema Code that a lodging property chooses to add to their website to announce an Event. Step 4: Know that AIHP, PAII, and Acorn have joined forces to publish a Google Survey to 1,000 random Google users, both male and female, from all over the US, ages 18 through 65+. The snapshot of the ad, and its high-level results are below. We plan to publish a more detailed review of this data soon for any Innkeeper to be able to reference when talking about these issues. The survey was to help our industry determine if what we all are feeling is correct when it comes to Direct Bookings: that the blue BOOK A ROOM button on Google’s Knowledge Graph and Maps listings is misleading the public into thinking that they are Booking Direct, when in reality they are booking with whatever OTA that Google chooses to pick from the available list for that property. The results were very much what we were anticipating. 25.6% said yes, the blue BOOK A ROOM button would allow them to book direct. WRONG ANSWER! 44.1% said they didn’t know. THIS IS THE PERCENTAGE OF USERS THAT GOOGLE HAS CONFUSED! Only 30.3% said no, the blue BOOK A ROOM button wasn’t a direct booking. CORRECT ANSWER! So that means that 69.7% of those surveyed are confused or do not understand that the blue BOOK A ROOM button is indeed booking with an OTA and not directly to the lodging property. So, if you are wondering why your direct bookings are dropping, this may very well be one of the reasons. Step 5: Read through the AH&LA website publication regarding their Search Smarter Campaign. Included in this documentation is a way for your guests to report OTA booking issues, such as when a guest “thought” they were booking with you directly, only to find out they were not, and the potential problems that arise for both the innkeeper and the guest as a result of this situation. Step 7: Once you have gone through all this information, make a list of how these actions are affecting your Direct Bookings. Then, write a letter to your senator and congressional representatives, describing in your own words how your business is being affected by all these changes and outside companies. If any of the references listed above speak to your situation, or you feel you want your government representatives to back any of the initiatives, please, make sure to mention them in your letter, along with reference links as appropriate. Send your concerns via EMAIL, to the addresses matching your state representatives listed on the sites below. This entry was posted in aihp, ethics, google, paii by admin. Bookmark the permalink.